alaTest has collected and analyzed 307 reviews of SONY HDR-SR1/SR1E. The average rating for this product is 4.2/5, compared to an average rating of 4.0/5 for other Camcorders for all reviews. People really like the design and size. The portability and image quality also get good feedback. Many are critical about the memory. Views are divided on the price. We analyzed user and expert ratings, product age and more factors. 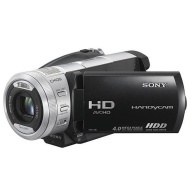 Compared to other Camcorders the SONY HDR-SR1/SR1E is awarded an overall alaScore™ of 85/100 = Very good quality. alaTest has collected and analyzed 11 user reviews of SONY HDR-SR1/SR1E from Amazon.co.uk. The average user rating for this product is 4.2/5, compared to an average user rating of 4.0/5 for other Camcorders on Amazon.co.uk. People are impressed by the price and durability. The image quality and usability are also mentioned favorably, but some have doubts about the portability. alaTest has collected and analyzed 188 user reviews of SONY HDR-SR1/SR1E from Amazon.com. The average user rating for this product is 4.3/5, compared to an average user rating of 3.9/5 for other Camcorders on Amazon.com. Opinions about the design and size are on the whole positive. The portability and image quality are also mentioned favorably. There are some less positive opinions about the memory. Opinions are divided on the durability. Record and enjoy exceptional quality High Definition movies with this stylish and compact camcorder. With a 30GB Hard Disk Drive there's no need to worry about tapes or discs, so you can always shoot on the move. Hard disk holds about four hours of best-quality HD video; sharp, saturated, low-noise video; excellent build quality; fast, smooth focus with effective image stabilization. Mediocre still photos; frequent motion artifacts in video; lame but necessary bundled software; no windscreen filter for microphone. The Sony Handycam HDR-SR1's combination of hard disk capacity, easy adapatability, great design, and a broad feature set make it the consumer HD model to beat for 2006. A very attractive high-end consumer camcorder, this is easy to use out-of-the-box, offering great features even if video quality could be better. One beautiful camera, with one awful flaw. The HDR-SR1E captures the AV stream to an integrated 30GB hard disk, which can store up to 11 hours in 5Mbps Long Play mode. Even in the special super-quality XP mode, which involves a stunning 15 Mbps, the hard disk can hold up to 4 hours of HD video. The Smart HDD Protection system makes sure that your cherished memories are safe. In addition to the specially designed physical shock absorbers in the camcorder, the drive itself can detect the sudden acceleration of a fall and instantly auto-parks its heads, preventing them or the platters from being damaged by the impact. Better still, if you are filming, the camera will buffer the stream until the camera is stable and operational again. Do you want to keep your footage on DVD? With a single press of a button you can burn your favorite moments on a DVD and treasure them forever, thanks to the One Touch Burn function.